I’ve had a whole bunch of new stuff arrive to review over the past week. A trio of Malekko pedals, thanks to Niche Music Supplies, and a Pirana KS-5C 5 watt valve combo thanks to Pirana Music. 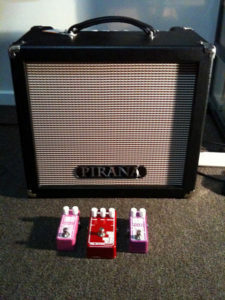 Pirana Music is a local store here in Canberra, and they have recently released their own “in-house brand” of keenly priced valve combos and heads. They range from the little 5watt deal like this KS-5C, through to 100watt heads. This is packing an EL84 poweramp valve, and a 12AX7 preamp valve. The KS-5C packs two channels with shared 3 band tone controls, and an effects loop. Housing a 10″ speaker this amp looks very similar to the Blackstar HT-5 combo, when comparing the features, but has a distinctly different tone. I look forward to putting this through it’s paces over the next week or so. 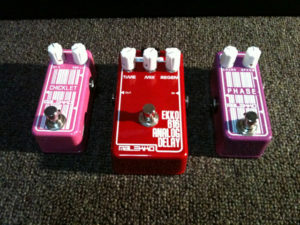 A trio of Malekko pedals: Chicklet Spring Reverb, Ekko 616 Analogue Delay, and the Phase Analogue Phase Shifter. The trio of Malekko pedals I have to check out look like fun too. I’m really looking forward to giving the Ekko 616 a good run as I’ve been looking for a nice analogue delay to add to my rig. I love my Hardwire DL-8 Delay/Looper, but there have been times when I want a couple of different delays for one song, so adding an analogue delay seems the best thing to do. I’ve love a phaser pedal to round off my pedal board, and the Malekko Phase pedal looks like a brilliant little space saver pedal. I can’t believe how Malekko have crammed a phaser into such a small housing. The Chicklet was thrown in for testing by the guys at Niche Music Supplies as it’s the most popular Malekko pedal they distribute. I’m not much for reverb, but it should be good to test it out. It might convert me to wanting one. Reviews for all of these products should hopefully be published in the next month or so. Keep an eye on my blog for updates.